Experienced StaffOur team of waiting staff are very experienced and have been with us for many years but we never take anything for granted. Before each and every function I brief the team and issue a catering plan. 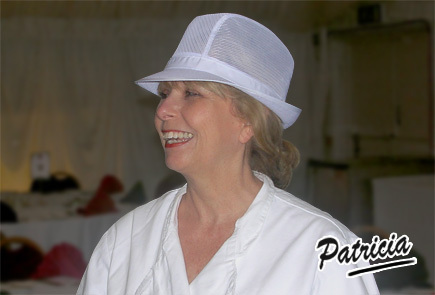 Patricia's Cuisine is a long-established catering business that was started by Patricia in 1994 to cook and serve high quality home-made foods for any occasion which are cooked, wherever possible, using fresh produce sourced from local suppliers in Bedfordshire and into Buckinghamshire. 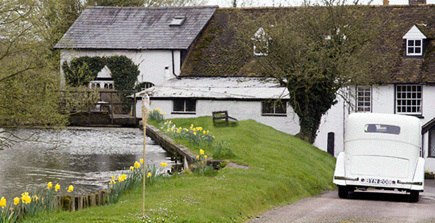 We cater with food that we personally source from local suppliers and food producers. We know that getting the catering right is an important aspect for your forthcoming occasion so, to help you get the catering right, Patricia will visit you to discuss your event, help with planning your menus and is happy to advise on any other aspects of your function. 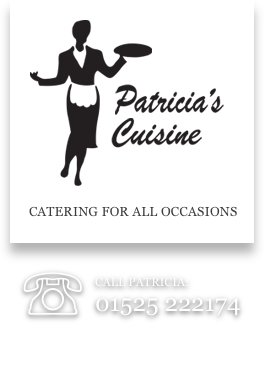 Patricia's Cuisine is based in Eaton Bray, Bedfordshire and caters for clients across Bedfordshire, Buckinghamshire and Hertfordshire. Our food is delivered in controlled refrigerated vehicles and all crockery, cutlery and any other necessary equipment is provided along with staffing if required. Most of our waitresses and kitchen staff have worked for Patricia's Cuisine for many years and wear a uniform of black and white. Patricia's Cuisine has a five star rating with the Department of Environment.